Unlike Yo-Yo Girl Cop, Dynamite Warrior actually had a plot I could follow. It's actually a pretty simple story with two threads that eventually intersect. One involves a man named Zieng who is searching for a man with a distinctive tattoo on his chest, for he saw this tattoo on the man that murdered his family. The other involves Lord Wang, a local big-wig businessman who wants to sell tractors to the farmers of the area, even though they could buy many water buffalo to do the same work for the same price of one tractor. Now, since nobody will buy Lord Wang's tractors, he devises a despicable plot. He hires on a group of badass guys to go around and kill all of the buffalo traders and steal all of their buffalo. He then sells the buffalo cheap to some other guy to get them out of the area, thus leaving the farmers no choice but to buy his steam tractors. Nothing a typically evil business man wouldn't do. Well, it works for a while, until his gang of miscreants eventually encounter one specific group of buffalo traders led by a man named Nai Hoi Sing. Until now, they've been able to beat anyone who stood in their way, but this guy is different... this guy is MAGIC! (Imagine little sparkles coming off that word.) This dude is fierce, and can hit men just by punching thin air! Coincidentally, Zieng happens to be hiding nearby watching the attack, as he was planning on attacking them himself. Ah, this would be a good time to specify that Zieng goes around and steals Water Buffalo from traders to give to the poor farmers. He never kills anyone, but he always opens their shirts and looks at their chest to see if they have the tattoo. Why buffallo traders? Because it was a buffalo trader who killed his parents (oh yeah, never saw that coming). So during the battle, Zieng spots the tattoo on Nai Hoi Sing's chest, which seems weird to us audience members because up until this point Nai Hoi Sing has been portrayed as very honorable guy, not one that would kill in cold blood. But Zieng never got to see any of that, so he just goes off and starts attacking the guy. Now, Nai Hoi Sing may be fierce, but Zieng is pretty dang good too. He even actually makes contact with Nai Hoi Sing. But the dude's magic is just to powerful, so Zieng doesn't get his man. From here, both Lord Wang and Zieng seek to find a way to stop Nai Hoi Sing. I don't want to ruin the story for you, so I'll just leave it at that, though don't expect any plot twists that you won't be able to already figure out early on. Unlike American movies which try to provide a lot of evidence to lead you one direction, with very discrete clues so that when a plot twist comes you'll think it makes complete sense, this one pretty much lets you figure out exactly what's going by providing obvious clues that an elementary school kid could figure out. Like many Thai action scenes, knees are uses A LOT. It is cool to look at, but by the end of a scene it's hard not to think that they're knees must be absolutely killing them. C'mon guys, you can hit people with other body parts too. The look of the movie was great, but the dubbing was done in a completely silly manner, just like in those old dubbed martial arts movies. The voices are totally caricatures, and aren't serious even a little bit. It was much better watching it in Thai, and personally I wish they would have dubbed it seriously. Got voices that fit the actors, preferably with some Thai accents. 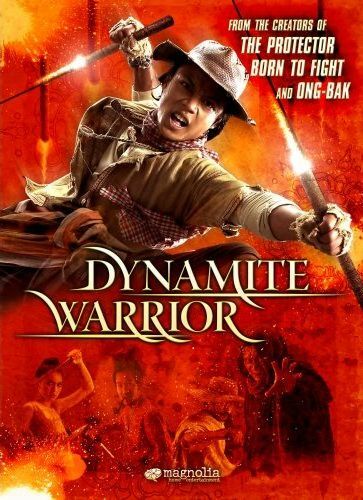 Dynamite Warrior releases on July 17, 2007 by Magnolia Pictures.